The most surprising quality of Win Elvis-n-Space is how relatively normal it is. If you replaced all the Elvis elements, you’d have a competent-but-messy miniature space exploration game in the style of Weird Worlds: Return to Infinite Space. But it’s not. This is a game about a mission to rescue Elvis from aliens. Win Elvis-n-Space suggests that Elvis never died; instead, music-obsessed aliens imprisoned him on Graceland, their recently renamed home planet. With the help of the extraterrestrial research group SIVLE, Lisa Marie Presley commissioned the construction of an X63 spaceship to hunt down the alien aggressors, and you have been chosen to lead the mission into the depths of the galaxy. Graceland itself cannot be penetrated by conventional means, but if you steal enough Elvis-related relics from the wreckage of alien warships, you can ransom them in exchange for the King himself. So it’s a little weird. Every second of Win Elvis-n-Space should have been this insane, but to begin even appreciating it, you have to contend with quite a confusing barrier to entry. The game overloads on interface elements, throwing in on-screen contextual menus, semi-interactive status windows, a slew of action buttons with no associated descriptions, and a running ticker that explains what’s happening. Until you figure out what commands are located where and which buttons are redundant, the game is close to incomprehensible. There is an in-game help system, but it offers few useful details and leaves the legwork to the help file – which does a poor job explaining the game’s concepts in a logical order. I started and quit the game several times before figuring out how to play. 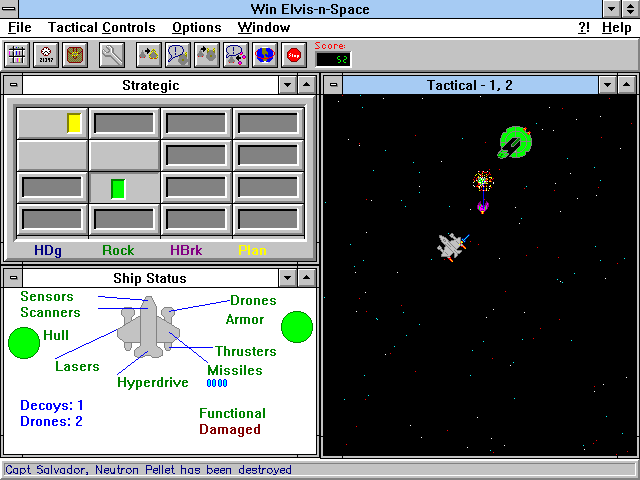 Once you get past the monumental barrier to entry, Win Elvis-n-Space reveals itself as a decent but cluttered space strategy game that never quite meets the heightened lunacy of its premise. At any time, you can travel between adjacent spaces on a 4×4 grid representing the galaxy; each zone contains some combination of enemies (given appropriate names like Heartbreakers and Hound Dogs) that might hold one of the Elvis relics. Exploration holds the same simple pleasures as moving around on a board game, and each of Elvis’s treasures is delightfully weird. A typical playthrough lasts only twenty-odd minutes, a welcome respite and the perfect length for a game without too much variety. 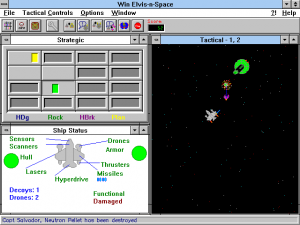 Win Elvis-n-Space throws in a few macro-level strategic considerations as well: you have a limited amount of combat resources available, and up to three times in one game, you can hail a supply ship to restock your missiles and such. (You can also manually repair ship components, but this rarely happens since failure in combat is typically an all-or-nothing proposition.) Harder difficulty levels increase the quantity of enemies and supplies, offering an interesting reason to replay. Unfortunately, the ship-to-ship combat comes across as disjointed. And since so much of Win Elvis-n-Space revolves around killing aliens for their relics, this lends the whole game the same feeling. The game pauses any time a major action occurs (such as a ship takes damage), and in a typical fight with lots of lasers firing and attack drones moving around, combat basically grinds to a standstill. The game places a heavy emphasis on movement to evade attacks, but you move slowly and can rarely dodge enemies’ homing weapons. Worst of all, in a close-quarters battle, you can rarely understand what’s exploding or shooting. Victory in combat often seems lucky rather than strategic. It breaks my heart that the central component of this game doesn’t work very well. A game as conceptually strange as this one needs to be more than passable. Win Elvis-n-Space is begging for something extra – something weirder – that puts it onto a higher shelf of oddities. As it stands, it only offers sloppy combat that can be tasking to learn at a basic level. Imagine what this game could be if it let its hair down and fully committed to the Elvis cheese. On second thought, don’t get your hopes up. That would be cruel, and Elvis told us not to do that. I wonder, did the creator get a cease-and-desist from the Presley estate that triggered the change to Pelvis? Thanks for talking about these Windows 3.1 and early Macintosh games! I think they hold some overlooked gems–most people tend to focus on DOS games. Not to mention the added difficulty of emulating these systems. I remember this game! I had it on one of those 150 shareware games cds. I tried to play it like 10 or 20 times but it was very confusing.. It was scary to see starships, aliens and Elvis on the same screen, I thought it was a music game or something like that 😛 Anyway, now that you say that it’s so messy and hard to learn, I don’t think that I could have played it when I was 10 and without knowing english. Mike: I tried getting in touch with Brett McDonald to no response, understandably. But it’s worth noting that BFM Software never changed the names of two other copyright-infringing shareware titles (Win Trek and Win Battle, both of which play identically to WEnS). That seems to indicate a direct challenge to WEnS rather than a pre-emptive decision to stay in safe legal waters. 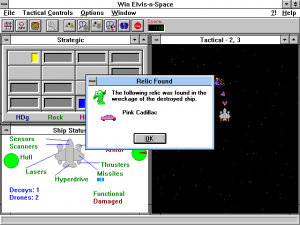 The updated Win Pelvis-n-Space also omits a weird, slightly unsavory piece of flavor text alleging that Elvis was murdered by a “jealous husband” who married a Priscilla Presley lookalike. I wonder if that upset the right people, as that’s the only other change to the game. Does anyone have a registration password? I would like to finish this game from my childhood just once.